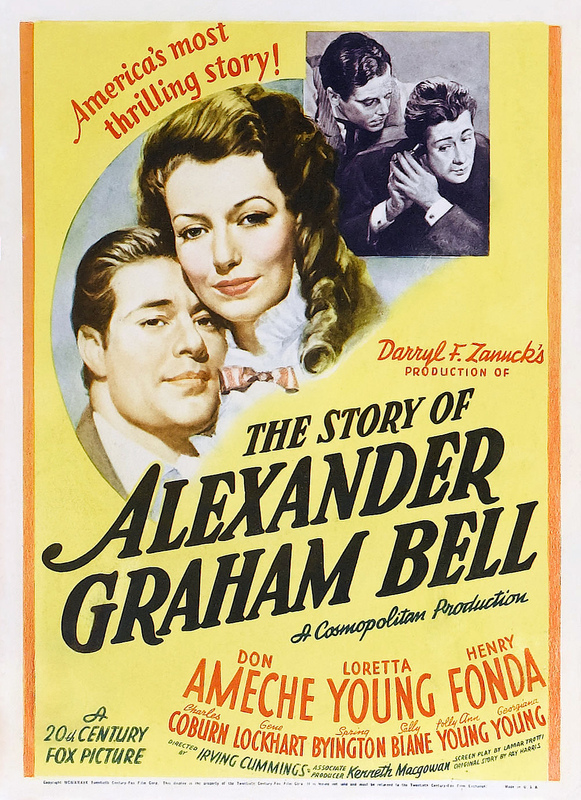 “The Story of Alexander Graham Bell” screens at 1:30 p.m. Saturday, May 10, 2014 in the Durwood Film Vault of the Kansas City Central Library, 14W. 10th St. Admission is free. It’s part of the year-long film series Hollywood’s Greatest Year, featuring movies released in 1939. Every now and then an actor becomes inseparable from a role. Anthony Quinn will always be Zorba the Greek. Mention Christopher Reeve, and you can’t help envisioning him wearing Superman’s cape. 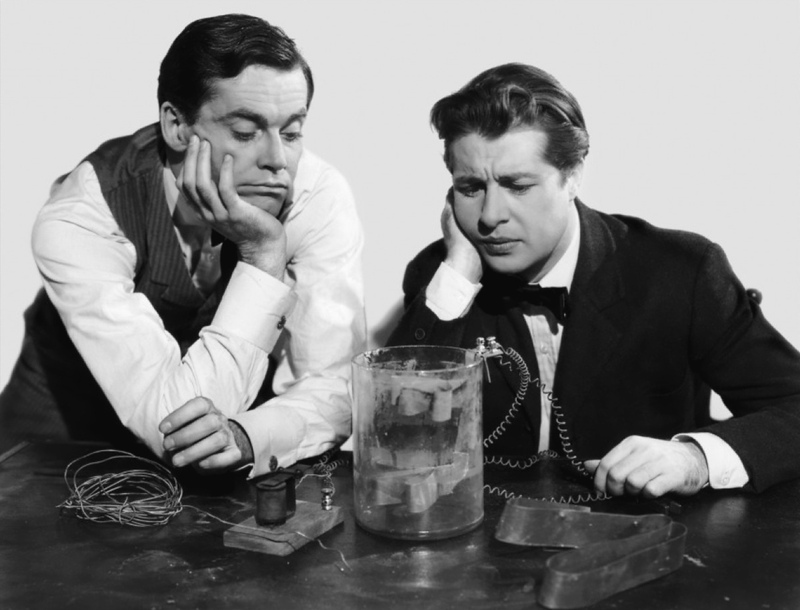 And Don Ameche will always be Alexander Graham Bell, the inventor of the telephone. It was an impressive display of the culture-molding potential of a hit movie. The film unfolds mostly in the 1870s and ‘80s when the Scottish-born Bell was struggling to perfect the technology that would allow the transmission of sound over copper wire (a widely-held misconception was that telephone wires were hollow, carrying sound like water through a pipe). It’s a classic tale of a starving genius. Bell and his cohort, engineer Thomas Watson (Henry Fonda), live in a series of mildewed garrets and practically succumb to hunger before their big breakthrough. The film does a pretty good job of laying out the basics of Bell’s story – his interest in teaching the deaf to speak (his mother was hearing impaired), his marriage to a deaf woman (played by the gorgeous Loretta Young). Ameche launched his film career in 1935, and in the four years leading up to “The Story of Alexander Graham Bell” he had been very busy, appearing in more than a dozen films, usually as the second male lead. His biggest hit of this period was In Old Chicago, a spectacular recreation of the 1871 fire in which Ameche played a member of the O’Leary family, whose cow was blamed for kicking over a lantern and setting off the conflagration. At the same time Ameche was omnipresent on the radio, serving as a master of ceremonies on a slew of programs. By the time he turned 30 he was a household word. In “Alexander Graham Bell” Ameche provides a comforting and hugely earnest anchor, but the real acting chores fall to his supporting players. Comic relief is provided by Fonda as the kvetching Watson, and stuffy Charles Coburn as Bell’s father-in-law, a man who directs the lives of his family members according to a carefully thought-out timetable. “Young Mr. Lincoln” screens at 1:30 p.m. Saturday, May 3, 2014 in the Durwood Film Vault of the Kansas City Central Library, 14W. 10th St. Admission is free. It’s part of the year-long film series Hollywood’s Greatest Year, featuring movies released in 1939. In the essay “Mr. Lincoln by Mr. Ford,” the great Soviet movie maker Sergei Eisenstein – whose 1925 silent film Battleship Potemkin remains embedded in most critics’ short lists of the best movies ever made – speculated on the one American movie he wished he had made. Seventy five years after its creation, the film still retains an astonishing ability to tap into our shared mythology. Much of Ford’s artistic output can be summed up in one question – What does it mean to be an American? – and “Young Mr. Lincoln” provides some essential answers. 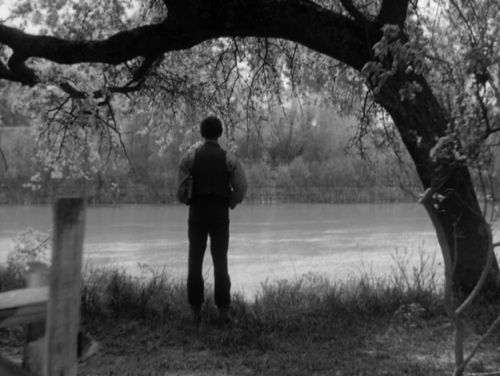 As the title suggests, Lamar Trotti’s screenplay is about Lincoln before he became a famous icon. It covers the early months of his law practice in Springfield, Illinois in the 1840s, and centers on Lincoln’s first big case, a murder trial. (Actually, it is a highly fictionalized version of a murder case that Lincoln handled in 1858, shortly before he got into national politics). Watching the film today one is struck by how much actor Henry Fonda looks like photos of the young Lincoln (Fonda donned a prosthetic nose and wart for the role, and at one point rides a miniature mule that makes his legs look ridiculously long). It’s an astounding performance, one that gives us a rough-hewn, unpretentious Abe but which is packed with intimations of the greatness that is to come. “Jesse James” screens at 1:30 p.m. Saturday, March 15, 2014 in the Durwood Film Vault of the Kansas City Central Library, 14W. 10th St. Admission is free. It’s part of the year-long film series Hollywood’s Greatest Year, featuring movies released in 1939. 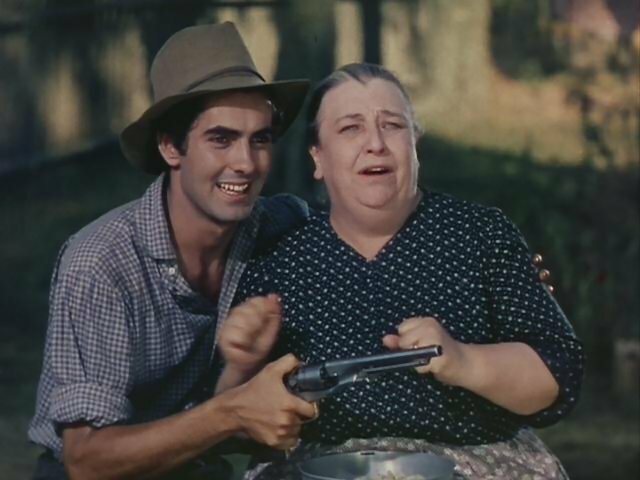 You don’t watch the Tyrone Power/Henry Fonda version of “Jesse James” for an accurate history lesson. If you want something approaching realism in a depiction of the infamous James Gang, try 2007’s excellent “The Assassination of Jesse James by the Coward Robert Ford” with Brad Pitt as the psychotic outlaw and Casey Affleck as the repellent little creep who shot him in the back. Back in 1939, though, audiences were all about a romantic Jesse James, and this Henry King-directed Western delivered. It’s highly selective in the story it tells. For example, it makes no mention of the James brothers’ background as ruthless Confederate guerrillas during the Civil War. 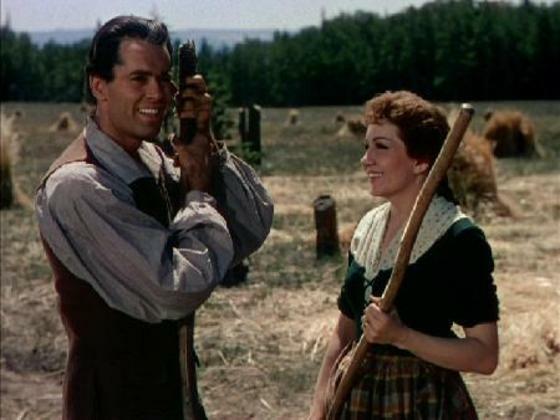 Rather, Jesse (Power) and Frank (Fonda) are presented as simple farm folk (albeit good with guns) who turn to violence when a brutish agent for the railroad attempts to seize their land – and kills their mother with a bomb. “Drums Along the Mohawk” screens at 1:30 p.m. Saturday, March 8, 2014 in the Durwood Film Vault of the Kansas City Central Library, 14W. 10th St. Admission is free. It’s part of the year-long film series Hollywood’s Greatest Year, featuring movies released in 1939. Director John Ford had a terrific year in 1939. One of his films from that year, Stagecoach, was instantly recognized as a classic and was nominated for the Academy Award for best picture. Plus, it turned around the career of a middling cowboy actor named John Wayne, who thereafter was one of Hollywood’s greatest stars. Another Ford effort from ’39, Young Mr. Lincoln (with Henry Fonda excelling as the future president), is recognized as one of the finest pieces of Americana ever captured on celluloid. Given the stratospheric acclaim directed at those two landmarks, it’s not unusual that Ford’s third film from ’39, Drums Along the Mohawk, often gets overlooked. Which is a real shame, since it’s a strong effort that dovetails seamlessly with Ford’s recurring theme of what it means to be an American. In addition, it was Ford’s first Technicolor film, and right out of the gate he excelled at capturing brilliant, vibrant images. In fact, he dismissed color as ridiculously easy to work with when compared to black-and-white. Based on Walter Edmunds’ bestselling novel (it’s still a great read), Drums centers on the Revolutionary War as it was fought on the frontier, with Yankee settlers battling Indian tribes. The Indians have been convinced by the British that as an independent nation, Americans would waste no time in sweeping westward and seizing tribal land, and that their best interests are to be found by siding with the redcoats. That’s the story’s background. But the real meat of the yarn lies in the relationship of and Gil and Lana Martin, newlyweds carving a life out of the wilderness.